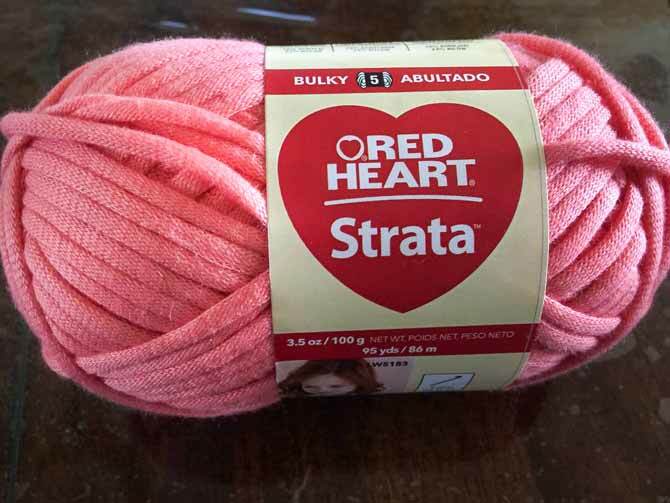 Today we’re going over Red Heart’s Strata yarn; it might be bulky, but it’s the perfect yarn for knitting during the summer months. With lots of fun summery colors and a very light feel, it’s smooth on the skin, very much like a t-shirt would feel. There are a whole slew of projects I already have in mind for this yarn. Follow me! When I first unboxed this yarn, it was in with a couple different types of yarn, but I was drawn to it immediately from the texture. It feels silky and cool to the touch. When I took a closer look I realized it had a tube web-like construction, which gives it lots of stretch and the air-y texture I was noticing. The jersey soft webbing construction. The fiber composition is 76% Acrylic and 24% Nylon, which means machine wash and dry! 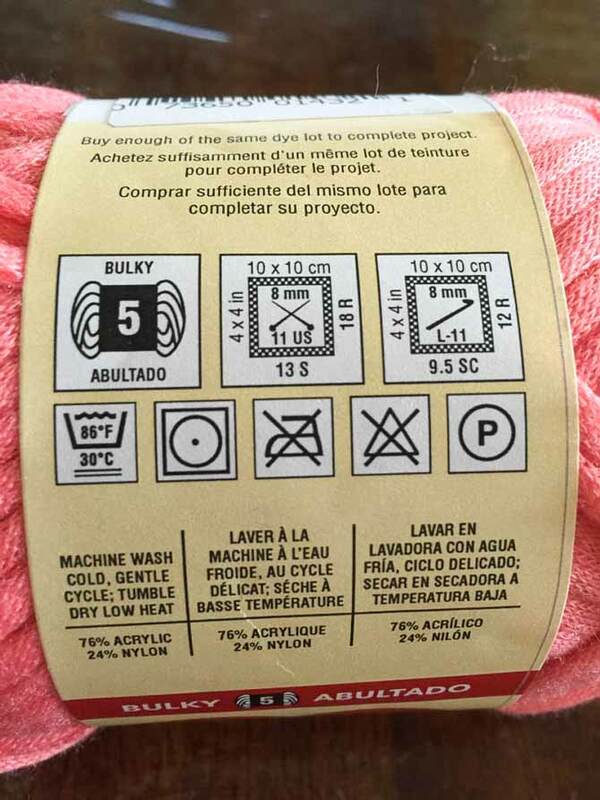 The instructions on the label are machine wash cold, tumble dry low, but that’s common, you don’t want to put too much strain on the fiber and change the dimensions of your garment. If you absolutely want to be sure, I’d make a swatch and wash that bad-boy the same way you would want to wash your garment. Just to see what happens. Washing instructions and all the important information. Another thing that really caught my eye is the pattern on the label. Usually I brush by these because they are something like a hat, stockinette scarf, or an afghan that requires you to get a lot of yarn. The one on this label is extremely well suited to this yarn. 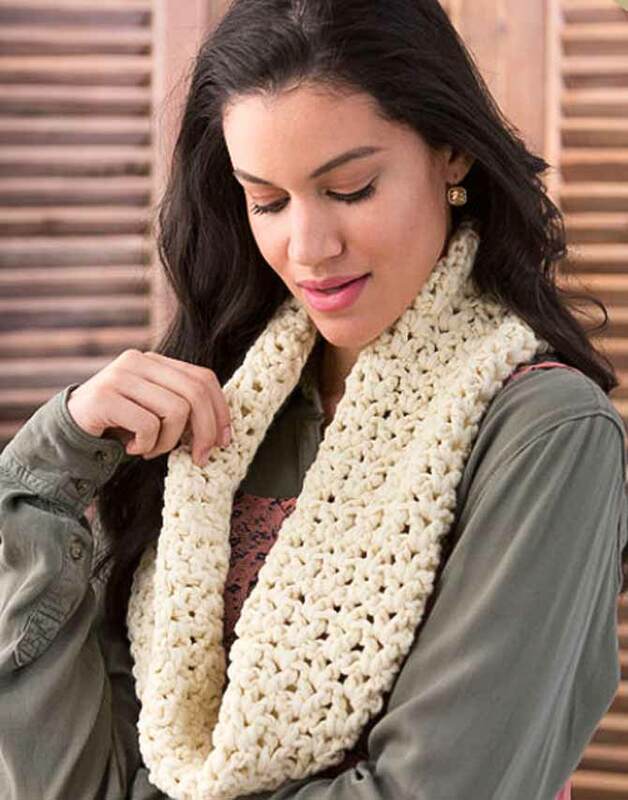 It’s an airy cowl, an open stitch pattern that would be so deliciously squishy when knit up with this yarn. Placed on the model, it complements her shirt perfectly and looks natural. It’s something I could see people wearing; I feel like I should knit a few for my ‘last minute gift’ stash. This pattern is a crochet pattern, but perhaps I’ll see if I can turn it into a knitting pattern later this week. I love knitting with Strata yarn, it slides really well on the needles. I prefer bamboo needles just so I feel like I have a little more control; then the yarn isn’t sliding everywhere all willy-nilly. 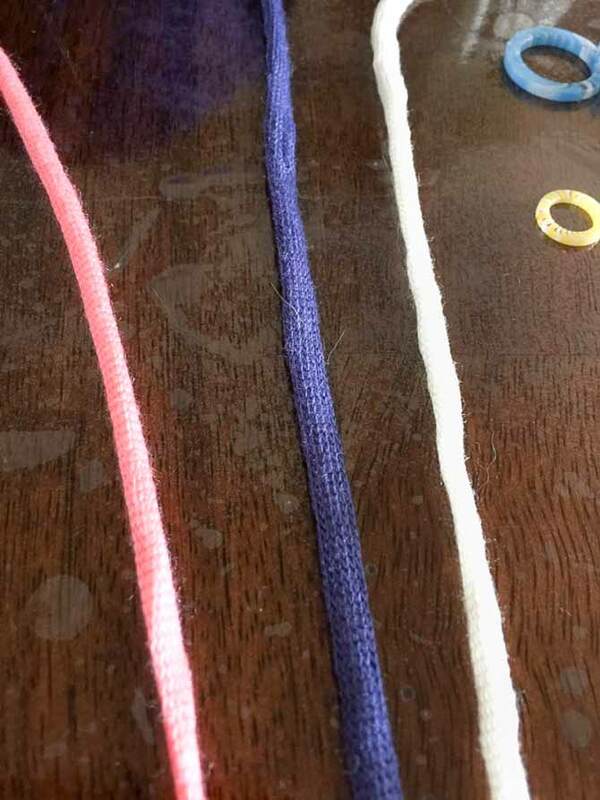 If you’re looking for some really easy-glide yarn, this is it! On the metal needles it moves along like a dream. If you’re using bamboo needles like me, just make sure your needles are in good working condition with no splinters; the same goes for wooden needles. I think this would be an excellent yarn for those with pain in their hands while knitting since it doesn’t take a great deal of strength to wrangle. 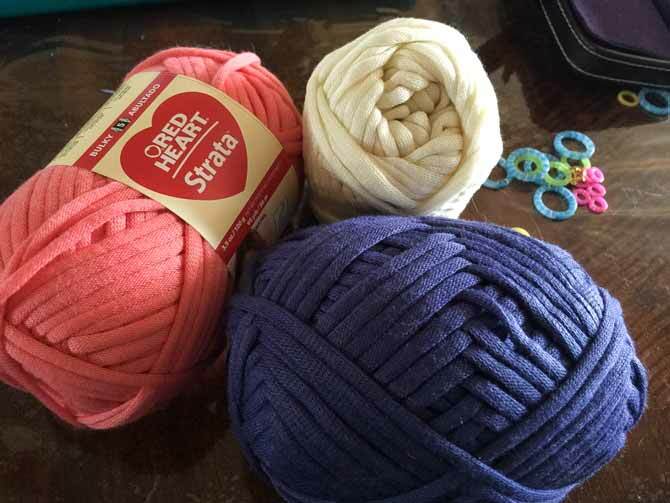 Red Heart’s Strata yarn in the beautiful coral color! With summer coming up fast and furious I think it will lend itself well to summer knitting. It’s supposed to be a hot one this year, so start gearing up for ‘sweltering heat’ knitting!